Saturated dark ruby. Cassis, shoe polish, camphor and rose petal on the nose; this reminded me of a great vintage of Latour. Dense and extremely concentrated; explosive yet totally backward. There nothing playful about this infant claret. Finishes with extraordinary, slow-building persistence. 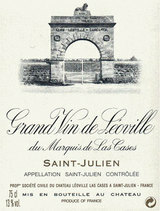 Very serious juice; one of the great Bordeaux of the 1980s. Drink 2010 through 2035. 97(+?) points. Firm and focused, with beautifully articulated currant, raspberry and nutmeg aromas and flavors; very supple for such a lean-textured Bordeaux. Approaching drinkability, but it can use until 2000 to soften.